The Finance Ministry has targeted monthly GST collections to be Rs 1-lakh crore for this fiscal, but the actual mop up has fallen short of the target month after month, except April. The GST revenue collection for September crossed Rs 94,000 crore as compared to Rs 93,960 crore in August. The latest GST number remains broadly on expected lines but falls short of the Rs 1 lakh crore target, say analysts. 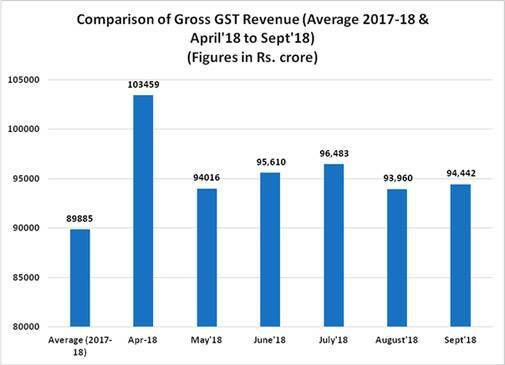 The total gross GST revenue collected in September is Rs 94,442 crore, of which CGST (central tax) amounts to Rs 15,318 crore, SGST is Rs 21,061 crore, and IGST is Rs 50,070 crore. In a statement, the Ministry of Finance said the IGST of Rs 50,070 crore includes Rs 25,308 crore collected on imports, and cess of Rs 7,993 crore (including Rs 769 crore collected on imports). The total number of GSTR 3B returns filed for August up to September 30 is 67 lakh." The total revenue earned by the central government and the state governments after settlement in September is Rs 30,574 crore for CGST and Rs 35,015 crore for the SGST, the ministry said, adding the revenue collected in September shows an upward trend as compared to the August collection. The GST revenue collection for July was Rs 96,483 crore. The tax revenue from the GST collection increased as compared to Rs 95,610 crore during June. The collections stood at Rs 94,016 crore in May. The Finance Ministry has targeted monthly GST collections to be Rs 1 lakh crore for this fiscal, but the actual mop up has fallen short of the target month after month. The sole exception was April in which the numbers exceeded Rs 1 lakh crore. 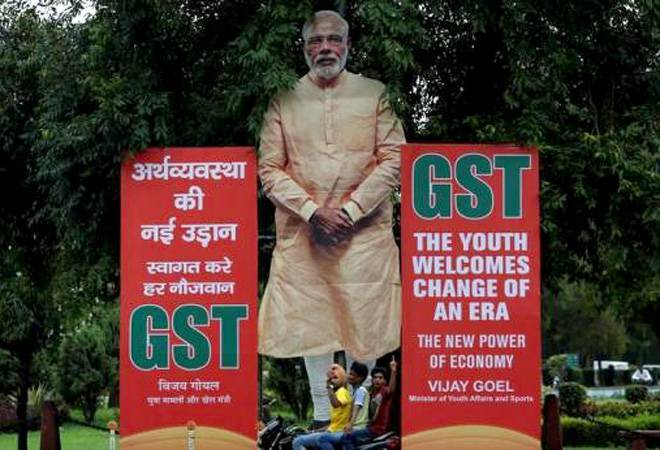 Meanwhile, the GST Council last week set up a seven-member ministerial panel under Bihar Deputy Chief Minister Sushil Modi to examine the legality of imposing a new tax on certain goods and services to raise resources for natural calamity-hit states like Kerala. The panel, headed by Union Finance Minister Arun Jaitley and comprising representatives of all states and UTs, also took stock of the shortfall in tax mop up by majority of the states under the new indirect tax regime.